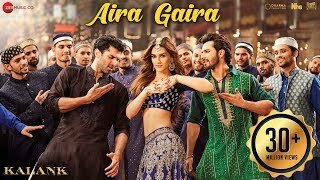 Aira Gaira Lyrics from Kalank: The song is sung by Antara Mitra, Javed Ali, and Tushar Joshi which has music composed by Pritam with lyrics written by Amitabh Bhattacharya. The song is choreographed by Remo D'Souza and picturised on Kriti Sanon, Varun Dhawan, and Aditya Roy Kapur. Samjhe kaahe aira gaira natthu khaira aa..
Duniya daari aaye haaye haaye..
समझे काहे ऐरा ग़ैरा नत्थू ख़ैरा आ..
दुनिया डारी आए हाए हाए..